Houston overcomes a late six-point deficit and extends its winning streak to 15 with a 123-120 victory. 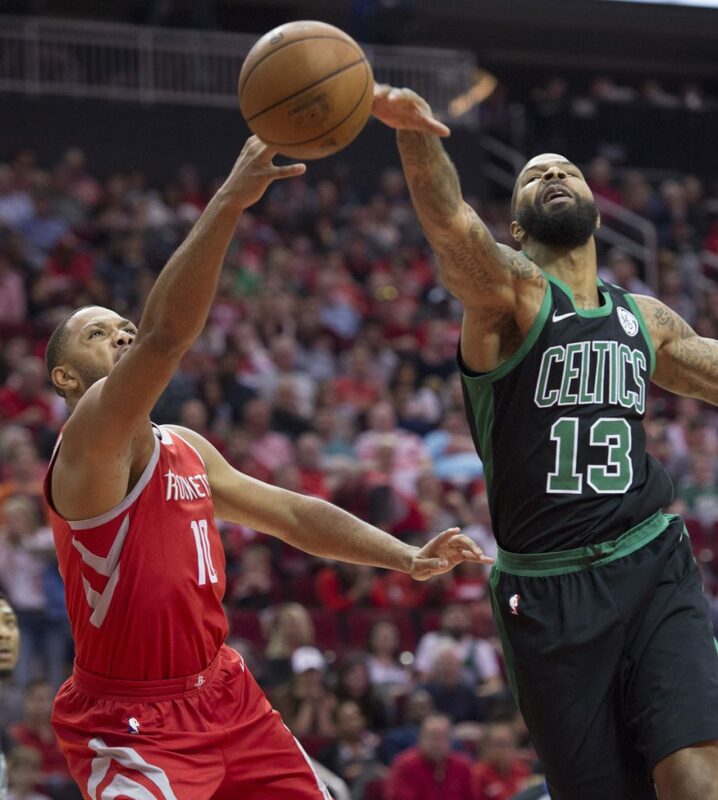 HOUSTON — Eric Gordon scored 29 points off the bench, James Harden had 26 points and 10 assists, and the Houston Rockets outlasted the Boston Celtics 123-120 on Saturday night to extend their winning streak to a season-high 15 games. Houston trailed by six before using a 10-2 run, with the last five points coming from Trevor Ariza, to take a 117-115 lead with 1:16 remaining. Ariza made a 3-pointer before stealing the ball from Kyrie Irving and finishing with a basket on the other end. Al Horford missed shots on Boston’s next two possessions before Chris Paul made two free throws with 15 seconds left to push the lead to four. Irving made a layup seconds later, but Harden made one of two free throws with 7.4 seconds left to make it 120-117. Irving and Paul hit two free throws each before Irving made one and purposely missed the second with 2.8 seconds left. The Rockets got the rebound, and Gordon made one of two free throws to make it 123-120 with 2.3 seconds remaining, and Marcus Smart’s 3-point attempt bounced off the rim at the buzzer. Houston’s winning streak ties the second-longest in franchise history, accomplished twice during Hakeem Olajuwon’s tenure in the 1990s, and trails only a 22-game run the Rockets had in the 2007-08 season. Marcus Morris had 21 points off the bench for the Celtics, who had won four in a row since the All-Star break. Paul, who sat out with an injury in the previous game against the Celtics, added 15 points and Ariza had 21. Boston took the first meeting this season by rallying from a 26-point deficit for a 99-98 win on Dec. 28. Boston led by three entering the fourth and was up by the same margin early in the quarter before Houston used a 6-2 run to take a 96-95 lead with about 9 1/2 minutes left. Morris hit consecutive 3s to put the Celtics back on top, but Gordon answered with two 3-pointers in less than 30 seconds. Morris then scored five straight points to push Boston’s lead to 108-102 and prompt Houston Coach Mike D’Antoni to call a timeout with about 6 1/2 minutes left. Houston scored five straight points, highlighted by a 3-pointer from P.J. Tucker, to cut the lead to three with about 8 1/2 minutes left in the third quarter. But the Celtics scored the next four points to make it 74-67. Boston’s offense went cold after that, and the Celtics didn’t score for more than three minutes as Houston scored nine points in a row to take a 76-74 lead with less than five minutes remaining in the third. Gordon and Ariza got things going during that stretch by hitting consecutive 3s. The game was tied later in the third when the Celtics got a delay-of-game warning before Coach Brad Stevens received a technical foul. Harden made a free throw on the technical and Nene added a basket soon after that to put Houston up 84-81. Boston used an 8-2 spurt, with four points each from Greg Monroe and Smart, to take an 89-86 lead into the fourth quarter. CELTICS: Irving finished with 18 points and six assists. … Boston made 13 of 24 3-pointers. … Terry Rozier scored 17 points and Monroe had 18. ROCKETS: Ryan Anderson missed his third straight game because of a sore left hip. D’Antoni said he expects Anderson to return sometime next week. … Paul received a technical for arguing a foul in the second quarter. … Clint Capela had eight points and 17 rebounds.